getting ready for the Coffee Harvest Celebration with Liga Masiva. 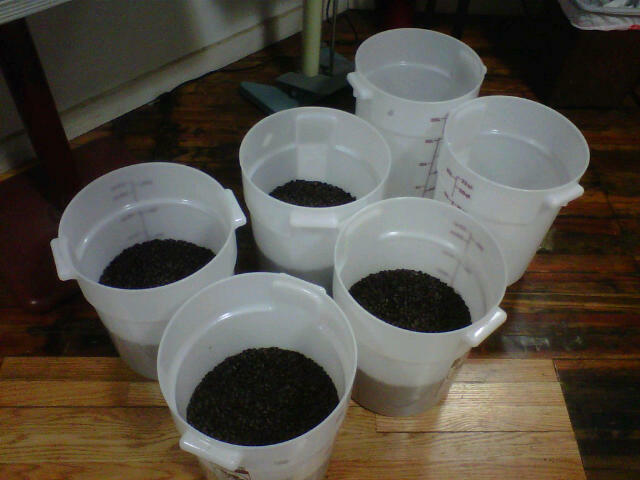 The sample roasting and cupping for this years crop took a lot longer than expected. Have been sample roasting and cupping the new crop for the last 3 days developing profiles for the 4 roast levels that we use in production. Still have a lot of work ahead before production starts early next week. Organic and Fair Trade Mexico Altura “Cafe de La Trinidad” – French roast. Mexican coffee is very popular at the Roasteria and this is the first time I have offered it as a French roast. With a silky body and Bakers chocolate notes and a slightly lighter finish it is a change from our usual big and brawny Indo French roast. Organic/FT Ethiopia Yirgacheffe “Michelle” Co op, heirloom – American roast – heirloom varietals are a look into how coffee tasted generations ago and this is a great one – tea like with soft milk chocolate, sweet lemon and beautiful bergamot notes in the finish. Costa Rica “Cafe Vida” is unlike any coffee we have had. At a City roast – it has a big thick mouth feel and a surprising richness that reads as fatty, malty chocolate with nice light fruit notes. Adjustments to time & temp worked as anticipated. First crack was moved further out to 7:15 and end time 9:00. Still not perfect – but this should be closer to a production roast outcome.